"This was the first time a player took on a persona in the game. Instead of controlling inanimate objects like tanks, paddles and missile bases, players now controlled a `living' creature," says Leonard Herman, author of "Phoenix: The Rise and Fall of Videogames." "It was something that people could identify, like a hero." It all began in Japan, when Toru Iwatani, a young designer at Namco, caught inspiration from a pizza that was missing a slice. Puck-Man, as it was originally called, was born. Because of obvious similarities to a certain four-letter profanity, "Puck" became "Pac" when it debuted in the U.S. in 1980. The company has several new games this year, including "Pac-Mania 3D," "Pac-Man World 3," "Pac-Pix" and "Pac-Man Pinball." It even began making a special 25th anniversary edition of the old arcade machine. "People say, `Who buys Pac-Man?' It's one of the few games where the answer is, `Everyone,"' said Scott Rubin, general manager of Namco America. 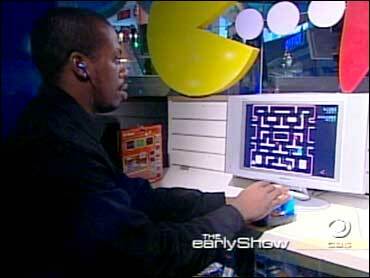 Herman said Pac-Man's place in video game history is forever secure, saying: "It was a milestone of video game history."